As one of depth-type media, high-efficiency and loading capacity make glass fiber filter perfect when used as prefilters. MS glass media are made by 100% borosilicate glass, with retention levels extended into submicron range. These depth filters combine fast flow rate with high loading capacity and retention of fine particulates. 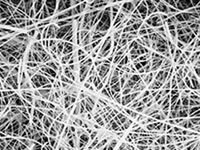 The small diameter fibers give micro glass media superior efficiency and dirt holding as compared to cellulose and synthetic media. For the gift nature of glass fiber, glass fiber media has many good applications in industry air filtration. The below table lists the physical properties of a range of glass fiber media at 65 +/- 5 gsm with nominal ratings from 0.5μm to 10 μm. The retention of latex beads or fine test dust and the dirt holding capacity follow the standard non-woven testing trends. 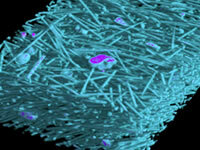 The glass fiber media utilizes small diameter fibers to achieve finer filtration. The pore size does appear to correlate to the efficiency and dirt holding.